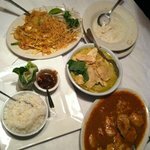 We have been going to lemongrass for at least 10 to 15 years. Every time we go, we have consistent, excellent food. The garlic basil fish is so tasty and amazing I have not been able to make anything remotely close. They have a great peanut chicken, and my kids absolutely love their Pad Thai. When they have salad rolls they are a must get ! They are amazing also!! The owner Chef always comes out to say hello and is very nice !! So glad to have this neighborhood restaurant!! This is probably the Most spicy food. If you LOVE spicy Food this is the place. We really enjoyed the food. In Portland for work, a group of us decided to grab Lemongrass for lunch. It was the best decision we made the whole week. Greeted at the front door of an old, beautiful house by one of the two employees, our experience began. We knew we were in for a special meal when Shelley, the owner, came out of the old kitchen to meet and greet us. She then made the most spectacular Thai food I’ve ever eaten. The Pad Thai is second to none. The spicy fried rice with chicken was out of this world and the prawns were amazing too. That was day one. The second day we decided to go back. Shelley was nice enough to cook us a traditional, off menu feast. There are no words to describe the flavors and the fabulous foods we ate. If you are in Portland and want to have amazing food in a beautiful historic home with the most incredible service, go to Lemongrass. You’ll never regret it. Was looking for some authentic Thai for dinner, and this place delivered. Nothing fancy, just delicious Thai food, flavorful, thoughtful and made with love. Papaya salad was top notch, well seasoned - curry had that faint hint of heat and full of fresh veggies. Thanks for a great meal!